holiday break between December 22nd - January 4th. As we find ourselves in the midst of the holiday hustle and bustle, we'd like to extend our deepest gratitude to all of our beloved clients for your dedication to KM Herbals. Your support means the world to us, and for you we delight in continuing to grow and improve our service. As you grow older, you will discover that you have two hands, one for helping yourself, the other for helping others." - Audrey Hepburn, her rendition of Sam Levenson's "Time Tested Beauty Tips"
We look forward to working with you all again in the year 2015. Get ready for some exciting new KMH developments! Wishing you a safe and happy holiday season! Wintertime is upon us, and as cooler temperatures set into our bodies, 'tis the season for achy muscles, stiff joints, and sore feet. Whether spending more time standing in line for holiday savings, working long retail hours, or simply enjoying outdoor winter recreation, this season can be particularly hard on our bodies. That's why it is a great time of year to give yourself a little extra care, starting with your body's hardest working support – your feet. Our feet are an integral part of our well-being, as many discomforts like chronic back pain can be rooted in poor foot health. The feet can also be indictors of many other complications in the body, so it is important to not leave them hanging when considering your health and personal care routine. Changes in your feet can often signal issues like alignment problems, nutritional deficiencies, and even serious diseases like diabetes. Getting to know your feet can help keep you more connected to your body and less likely to overlook any abnormalities that may arise. A great way to do this is with massage. Since your feet are the furthest away from your heart, circulation to that area is much more work, and any stagnation within the body can become quickly problematic. This is why massage and careful exercise are so important for stimulating circulation and maintaining the health of your lower extremities. You can take your foot massage one step further by paying attention to reflexology pressure points while massaging your feet. Reflexology is the practice of applying pressure or stroking specific areas of the feet and hands to stimulate the proper functioning of individual organs and body systems. These therapies existed in ancient Chinese and Egyptian civilizations, but the practice wasn't introduced to the United States until 1913 by ear, nose, and throat specialist William F. Fitzgerald. Since then, reflexology has shown very promising results within the medical community and is often a favorite healing tool for massage therapists and other body workers. One of our favorite go-to reflexology exercises is a wonderful trick for those who suffer from headaches or migraines. Simply apply a firm rolling squeeze to the fleshy part of your big toe for 10 seconds, alternating 10 seconds on and 10 seconds off. You can also massage from the the bottom of your big toe to the area between your big and second toe, again with firm rolling circular motions. Not only will this release pressure and sooth pain, but it will also stimulate blood flow to your feet and toes. Try it for yourself! 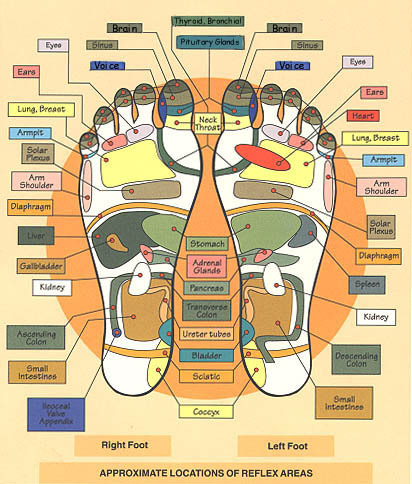 To learn more about reflexology, a great source is Mildred Carter, one of our favorite experts on the subject. She has several books available, including the popular Body Reflexology: Healing At Your Fingertips. If you are interested in taking classes, the American Reflexology Certification Board can help you locate a quality educational institute near you. Treat your toes to KM Herbals formulas...check out our Foot Care products! Photos used under Creative Commons by AnnaKika and torbakhopper.